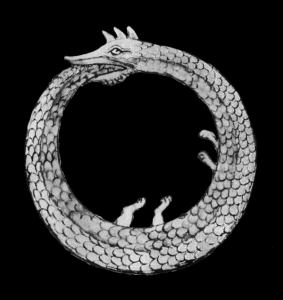 So Brendan of Necropraxis has released a product into the OSR o’verese, and this makes me very happy. I can’t say this is a completely non-biased review, as I have great fondness for Brendan as a creator of game content, have played in many of his games and plunder his ideas with Mongol like ferocity and persistence. All that said I am not always a fan of every rule change Brendan proposes and his relentless drive to pare everything down to its minimal mechanical elements (I suspect the man may dream in game mechanics) doesn’t always gladden my drunken baroque heart, so I feel I can pass judgment on Wonder & Wickedness as it is deserved in this review. I paid full price for the product (as I tend to do), so it’s not as if my ethics have been suborned by the offer of free game product (could they be? I really doubt it). Wonder & Wickedness is effectively a modular "bolt on" spell system for your older style fantasy roleplaying game, composed of unleveled spell lists and an efficient minimalist approach to gaming magic that emphasizes the fictional idea of magic as inherent creepiness, chaos and corruption while trying to use the most elegant and simple rules possible. It’s some spell lists, a magic system, magic items and an ethos. Wonder & Wickedness would likely work best for a game based around OD&D power levels and mechanics, but is not exclusive to any system. The book is also worth reading for other fantasy games, because mechanically it’s simple and evocative, meaning those who prefer more mechanically complex systems may have to adapt it, but they won’t find anything that is tied to another system and will find plenty of good ideas about running magic as a scary, powerful art with a distinct undertone of mystical foulness. I downloaded the PDF of Wonder & Wickedness through the webstore set up by Lost Pages - also home to the OSR gamebook artifact (hand bound with love) the Chthonic Codex, and the books for Into the Odd – making Lost Pages the new publisher for your intellectual, mechanically minimal OSR products. As a PDF, Wonder & Wickedness is of good quality, with high production values, and I suspect from what I’ve heard of the publisher's hardcopy products, that the book will be nicely done as well. I understand there are some sort of EU taxing and internet commerce suppression hijinx going on right now, so these link may not work that long, but while they do grab up Lost Pages stuff, and most likely it will reappear soon at one of the larger web retailers. The PDF was $10.00 US, which seems to be the new standard for high quality game PDFs from independent publishers. At 87 pages and with Russ Nicholson art throughout, and a generally polished look this feels fair and reasonable. The (wonderful) black and white line art looks good at 300% (larger then Nicholson undoubtedly drew it) and the writing is crisp with very few typographical errors. A functional table of contents allows easy access to the needed tables or appropriate spells, and while there is nothing revolutionary or profound about the layout and table design it is functional and inoffensive. Wonder & Wickedness contains a couple pages of rules for playing sorcerers and covering spell acquisition, casting and such. It’s a magnificent distillation of simple and effective game rules, disposing of spell levels, and offering modular simple rules for both magic specialization and counter spells. One element I especially like is the sorcerer’s ability to cast a “maleficence” in exchange for another spell – this is one of very few direct damage spells within Wonder & Wickedness, but available to all and suitably potent as either a magic missile style direct attack or an area effect attack. A couple pages might not seem like enough to rewrite the classic Vancian spell system, but Wonder & Wickedness manages to do it with a few interesting rule shifts. After the basics the book is set up with spell descriptions for the eight spells in each of seven magical specialties, and the descriptions are just full of evocative detail and strange game changing minutiae. As someone who has read a lot of AD&D and other spell descriptions these have a nice amount of flavor and limitations – something like "Spell of Subterranean Gullets” which is either passwall, dimension door or stoneshape and oozes flavor – “All tunnels, pits, and lacunae are the mouths, throats, and visceral spaces of the greater earth god Maxilor.” The spell effect itself is pretty standard fantasy fare, but the implementation demands and makes easy extra description and that provides an uncanny, rare and magical seeming spell effect. 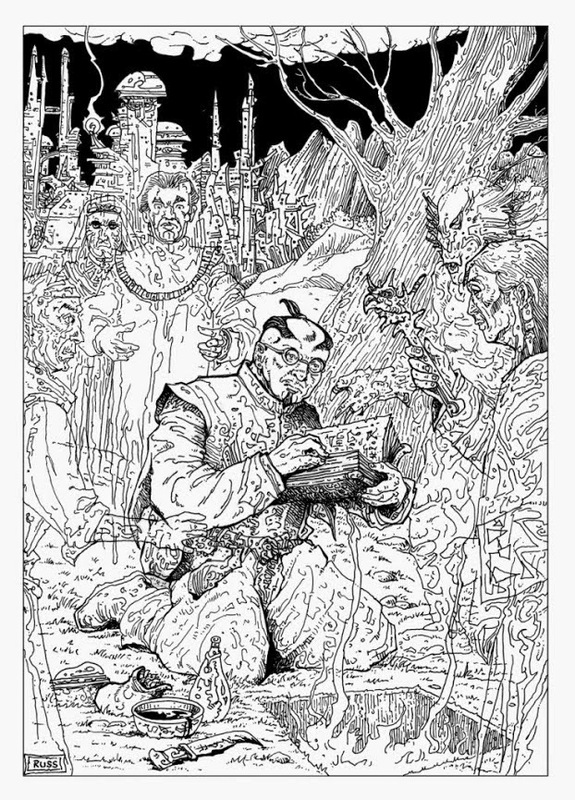 Many of the spells in Wonder & Wickedness are like this, classics (pulled from OD&D Brown “Booklet Number 1 – Men and Magic” according to the author), but dressed up in strange trappings that are a call and opportunity for even the most jaded fantasy game grognard to reexamine them as fantastical and strange. The way Wonder & Wickedness breaks out its spell schools while remaining true to the classic spell selection leads to some thoughtful and unexpected spells, such as its contextualization of healing as a necromancy spell. Indeed, all the schools presented in Wonder & Wickedness contain surprises that with no level limits, and an emphasis on non-combat spells, offer some interesting opportunities for exploration focused gameplay and in-game character development. Beyond the spells there are some amazing lists of “magic catastrophe” (12 for each magical school) and while the mechanics for using these tables are sparse – more of a nod to using them when they seem right for your campaign, these catastrophes, often far more powerful then the spells themselves, suggest a magic system offering players and GM a game world of constant awe and terror. Wonder & Wickedness also includes fifty magic items. All are interesting and most are excellent, with a different and unique feel. Magic items were always one of the more interesting game elements of Brendan's Pahvelorn campaign, and these items fall into the same sort of sometimes weird, sometimes whimsical, and often only situationally useful items used in that game. Generally Wonder & Wickedness' magic items have enough flavor and strangeness to at least imply a story and should spark players’ imaginations both as to their use and into keeping them for sentimental reasons. Most of the items are unexpected, and often things that aren’t found enchanted in most fantasy games (I count eight hats, hoods, caps and crowns) and many more have great effects that are counter intuitive (A magical mace that is useless as a weapon unless it’s in the hand of a corpse, which it will resurrect as a powerful warrior). The creation of a workable “level free” spell system. While magic-users applying the Wonder & Wickedness system will still constantly quest for and horde spells, the spell tables are remarkably well curated to allow spells that make a low level caster powerful, but still limited and yet grow in power over time. Certainly this might not work as well with a system where combat is the primary game focus, but in any system with a fairly flat power curve and the classic emphasis on exploration, the Wonder & Wickedness spell system should add to play and provide a flavorful alternative to the classic leveled spell approach. More importantly the magic items, spell descriptions and the catastrophes do an excellent job of indicating the sorts of risks and dangers that one can expect magic to overcome, and the sorts of perils it’s casters can create for themselves and others. Many of the magical catastrophes are potentially game changing, and more are adventure hooks in themselves. My personal favorite is an elemental spell failure that drags a small moon/asteroid to float 100 feet above area where the spell was cast. This would be enough, but Wonder & Wickedness decides to provide a small table of space rock descriptions, all of which have the potential for an adventure hook. The other catastrophe that was most evocative for me is one where an overflow of necromantic magic raises the angry bones of a “great, forgotten creature, deep beneath the earth” which will go on a rampage, and then just might start raising more vengeful antediluvian skeletons. The magic items are likewise evocative and well designed, with tiny histories and fairly unique effects that largely avoid the standard fantasy game magic. It is also nice to see that most of the items have creative drawbacks, curses or limitations on their use that again paint a world where magic is powerful, unpredictable and a bit frightening. That’s really the gist of Wonder & Wickedness, it’s a spell system with an ethos, largely successful at giving a strange and dangerous feeling to magic that vanilla fantasy games tend to drain away with familiarity and an overly mechanical approach to the stuff. The best part of this is that the sense of magic created by Wonder & Wickedness is nuanced, it’s not the entirely evil sort of sorcery one finds in Carcosa, where the only not completely anti-social way to play a Sorcerer is to specialize in the wards that prevent the use of magic. Wonder & Wickedness, through its spells and more the catastrophes associated with them provides a moral sense of sorts for each school of wizardry. Necromancy is powerful, and seems like it could be quite beneficial (having healing spells and such) but tends to have destructive longer term consequences as it leads to its practitioners becoming more and more unintentionally dangerous to the living. Elementalism is very staid and rule based, but ultimately rather neutral in its outlook with some dangerously arbitrary and cruel side effects. These outlooks for the various schools are entirely implied by the content, but add to the distinctions between the schools of magic and give more depth and fictional coherence to Wonder & Wickedness' magic system. There isn’t really anything bad in Wonder & Wickedness, though I feel like it could have a few more interesting spell mechanics included with the flavor, and while this would make the book less compatible with a wide variety of systems it would be interesting to see some new mechanics (why must the shocking grasp/lightning bolt analogue simply do the same HP damage as maleficence – have it attack Dexterity directly or something else that might kill a huge beast through convulsions), especially if they had the same elegance of the mechanics that are included. Still, this isn’t much of a complaint, and overall the spells and calamities described are interesting enough to get any good GM thinking about how to spice some of them up mechanically. What mechanics do exist in Wonder & Wickedness are also perhaps presented too subtly. It is clear that the system changes the book proposes are big, but the rules understated elegance might lead an unwary game master to introduce them without thinking out the consequences. I wish Brendan (who I know has thought out and tested these consequences) gave a bit more insight in how they are intended to effect a game. mentioned “Maxilor”, and others such as “Mergolder”, who gives his name to a suit of armor that can (sometimes permanently) turn its wearer into a wyvern are examples of this. I like the items and concepts involved (earth spirit with far too many mouths and ancient wizard king with an army of men transformed into dragons), but something just annoys me about these sorts of fantasy names. The silly names are easy enough to change to fit a given campaign and there is plenty of game history to justify them (First Edition D&D is full of this kind of thing), but I am irked by them, perhaps because they seem a waste of chance of more descriptive names likes like “The 10,000 Dragon Emperor” or “The Gorger Beneath” that provide a description and a sense of what’s behind the name instead of an easily forgotten and hard to keep track of mouthful of gibberish. Again this is a minor complaint largely based on my on stylistic tendencies, and has no negative effect on the content within Wonder & Wickedness. You can’t really reskin this product, it’s pure evocative fantasy content, that isn’t hard to place in any context where there’s arcane magic. I contemplate replacing my own magic system in the Steam/Diabolistpunk setting of the HMS Apollyon with the Wonder & Wickedness system. Even if one doesn't completely replace a current magic system, Wonder & Wickedness' spell descriptions will slip easily into any fantasy roleplaying game like a monster sliding into a deep black lake with only the tiniest ripples (where the spell system will then lurk to snap up the unwary). Still, Wonder & Wickedness could be added to. New specialties for wizards are certainly possible, perhaps encouraged, and I don’t think the schools presented in Wonder & Wickedness are a remotely exhaustive list of magic for a fantasy roleplaying, but that’s not reskinng exactly, that’s adding one’s own content. The one thing that seems to be really missing from Wonder & Wickedness is a spell research system, though this could be intentional, and suggests a world where there really are on forty two magical incantations of power. Wonder & Wickedness is a fun product, it’s interesting to read and gives a GM who is interested in a fantasy exploration style role playing game a lot of content to mull, while making a strong argument for a certain kind of ethos and game world where magic is not a mundane part of the fantasy, but has the classic Sword’s & Sorcery position of a rare and dangerous source of unpredictable power. Wonder & Wickedness is also supplementary in nature, it doesn't set its goal at entirely changing others' play-styles and gameworlds but offers as much high quality content as a GM feels comfortable using at a given time from an odd magic item or adventure hook to an entirely new way of playing the magic-user class. Even if one doesn’t really use the spells or spell system in Wonder & Wickedness, there’s enough thought here to provide a Game Master with ideas that can help fill out a campaign or two. While I might have implied that Wonder & Wickedness is somehow limited, this is largely the result of how good the content it contains is, and that it leaves the reader wanting more spells, more rule tweaks, more items and more gameworld. A entire old-school fantasy game with equally elegant mechanics to go with Wonder & Wickedness perhaps, or just a few wizard NPC and encounters to drop directly into a game? Wonder & Wickedness leaves me looking forward to more of these things from Lost Pages, Brendan and Necropraxis. "Russ Nicholson Art Throughout" is a blurb that could induce me to buy anything, but I would gladly buy this sans art. I'm so glad this is available now! Perhaps not as much art as one would like (though there won't ever be enough will there?) but several full page ones and a bunch of filler doodles link the text together. Ultimately though Wonder & Wickedness is good even if you don't look at the art. Been playing with this recently, and I really like it. Thanks for the review. I've been adapting the "Maleficence" rule myself, and removing all attack spells - though with leveled spells/spell slots. It's worked pretty well at very low levels.